Style: 23268 Name: Birth Date: Font: Please choose oneNoneInterlocking MonogramCircle MonogramScript Two LineOld EnglishRoman Three Line (Block) Who is this item for? This Pewter finished bank is tarnish resistant. 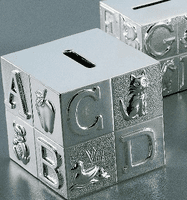 The sides of the bank have the letters A, B, and C.
Makes a wonderful gift with a child's name and birth date on the top. For more detailed information regarding how we engrave please see the Personalization Page.